A two person show with Brigita Ozolins at the SASA Gallery in Adelaide, Australia. The show was curated by Daniel Chaffee and Jennifer Rutherford. I had two pieces in the show: Playing the Library and eScape 50. Run your finger down a spine and remember where you were when you first touched that body. What desire kindled in you with the dust jacket? What stray thought took form as your eyes roamed across words that became you as you read them? What drive to consume drove you back again and again, to linger, to touch, to breathe in the book’s promise of containment. In my memory, there is not a critical moment without a book in it. Every memory is booked and every book has a body that embodies. Memories. Thoughts. Feelings. Desires. You cannot find them on the printed page. They are not written in black ink. But they are held fast in the body of the book. Form, content and memory indivisibly bound in the material body that is the habitus of the life lived through reading. My first book was yellow. On its cover was a bumblebeeand the words “All the best things in the world begin with a B.” I looked at the words and the words made sense and suddenly the book sprang into story. Today, when I open that book’s hard yellow covers, I am six years old and alone at night and I am making a discovery that will mean that I am never alone again. There is a boy, there is a butterfly, and there is a bumblebee. They all begin with a B and they are all found in this book and can be refound again and again. Decades later they are still there and the book is still with me along with hundreds of others that have travelled with me, giving duration to transience and form to fragmentation. Books have been fellow travellers and bedfellows. I have given myself to books, whiled away whole weeks in bed with books. I’ve been a nun for books piously studying their catechisms through long, solitary nights. I’ve gone hungry for books, wept over books, devoured books, fought for books, loved through books and always recollected myself through books. And I’ve lost myself in books. Travelling between France and Australia I lost a library, four crates of books disappearing en route to Australia. I like to think those books floated down into the bottomless ocean depths. Better that, than rifled through by strangers, my annotations open to their gaze. And now books themselves are starting to fall out of the world. Five hundred years after the invention of the Gutenberg press the body of the book is fast becoming the discarded shard of an earlier form. Books are not dead yet. They have many decades of life left in them and maybe there will always be printed books living beside their virtual counterparts. But the separation of form and content is radically transforming what the book is, what knowledge is, and how its systems of creation, production and circulation are organized. Since the 1980s, text has radically transformed. There are new ways of encountering meaning, new syncretic, interactive, multilayered forms of meaning, new collaborative ways of making meaning, and new ways of reading. Through these transformations, the old ways of being and becoming through books are being un-housed. When we read, we curl up inside the space of a book and make its thought ours, its body our own. Far from being a solitary act, reading is one of those rare moments when the boundaries between the self and the other collapse. In reading we become one with another, albeit the other of the text. This other is ours alone. No one inhabits the same book twice. Every reading remakes the book and the book remakes the reader.1 This is how books house our most intimate memories, creating a dwelling space for singularity within the shared space of the social. “Content” unhoused from form can’t house “us” in the same kind of way. Travelling disembodied in the virtual world, “content” is a new kind of commodity at work in the world in new kinds of unforeseen ways. The printed book transformed the world. As sociologists have argued, the book made us modern, made us part of the imagined communities and new collective selves of the modern nations. The book forged social connections between individuals across space and time and created identities built around new forms of affinity made possible by shared imagined worlds circulating en masse from hand to hand.2 We don’t know yet how the disembodied books of the digital revolution will create new ways of being human. Sociologist John B. Thompson argues that, along with the transformation of production and supply, the digital revolution is driving the devaluation of intellectual property and the processes of creation as “content” becomes “cannon fodder for large and powerful retail and technology companies like Apple and Amazon that use content to drive the sales of their devices and services to try and increase their market share” 3. “Content,” as a concept, in itself encodes multiple forms of loss. Book Futures explores these losses as the digital revolution remakes the future of the book. 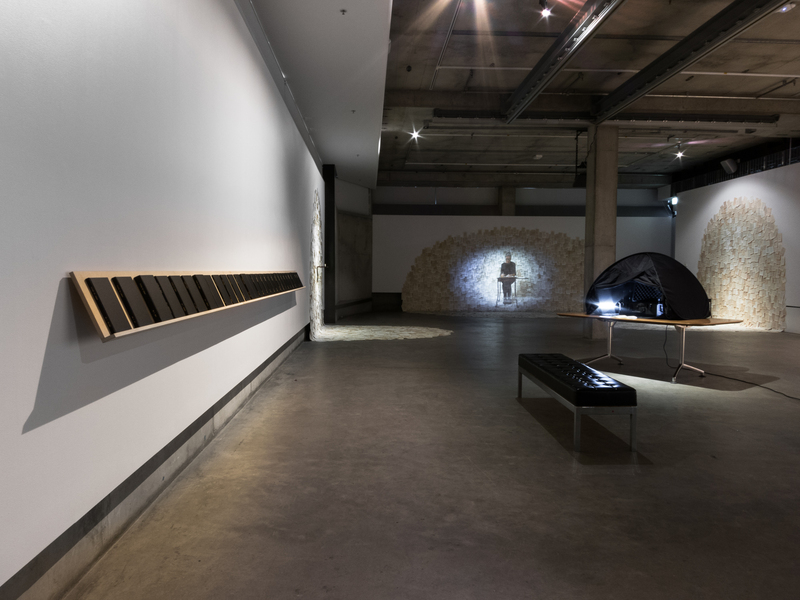 The artists in this exhibition, Tasmanian artist and academic Brigita Ozolins and Los Angeles based artist Tim Schwartz, have created site specific artworks that make visible the often unseen changes accompanying the disembodiment of the book. codes and writing, and The Reading Room (2011), an interactive installation that incorporated over 30,000 books. In Secretary, a woman sits at a small wooden table writing with great concentration over pages that she tosses to the floor where they gather into a landscape of discarded pages. The lighting is low and the air is filled with the hum of Cornelius Cardew’s Paragraph 7 from his avantgarde opera of 1969, The Great Learning, which is based on translations of Confucius by Ezra Pound. This work, as Ozolin writes, “conveys a sense of loss for the book in the codex form while also exploring the word as mystery, as secret knowledge.” Consisting of three large- scale elliptical installations, the work evokes a sense of panic as information spills out of control and as the secretary earnestly sustains her tasks of recording, sorting and storing information. Wearing glasses made from tree- rings, she seems to see something we can’t see, creating an enigmatic image of blindness in a site of knowledge cascading out of control. Artist Tim Schwartz brings the invisible unmarked losses of the digital age into focus. In early works such as Botanical Loss (2011), he created eerily beautiful prints of the colours lost in the translation of the first large format color botanical prints as they were scanned and turned into a “lossless” jpegs for the Biodiversity Heritage Library online. In Card Catalog (2008), he re-embodied the 7,390 songs in his personal iPod collection, cataloguing it in a wooden card catalogue box using the traditional cataloguing method of one card per entry. 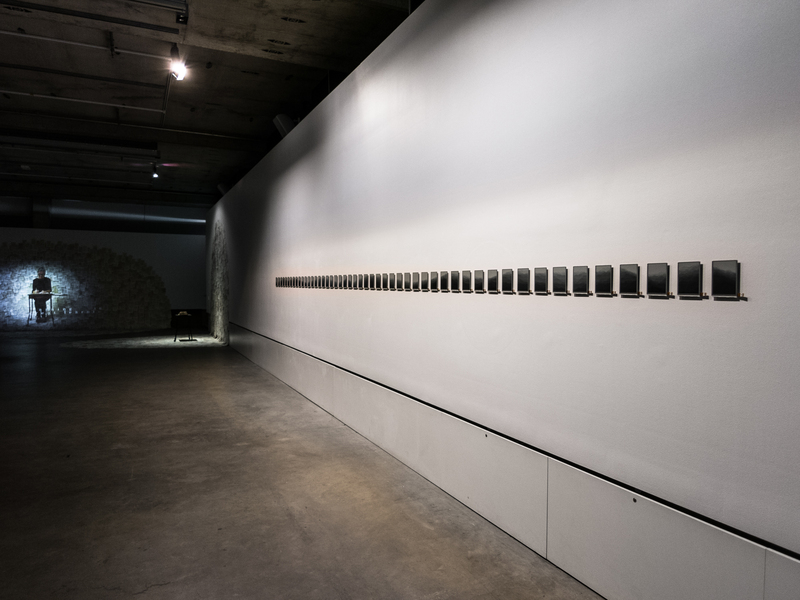 As the elongated catalogue box stretches across the gallery space, imagination attenuates to encompass the new limitless data of the digital age and, hovering in this uncanny space of decompressed knowledge, is the recipient of this vast volume of sound, a subject dwarfed by his re-embodied library. I n this exhibition, Schwartz creates a subtle visual vocabulary to explore the ways digital technologies transform our engagement with reading and representation. In Playing the Library, he focuses on the lost act of browsing, something you can only do in spaces where books are visibly and tangibly at hand. Browsing is one of the unnoticed losses of the digital age, as window displays and book-stacks are replaced by new search algorithms that plot browsing-pathways according to patterns of mass consumption. Libraries too are getting rid of books as they transform into user-friendly media stations with online journals and electronic resources. P laying the Library invites library “users” to perform the library by capturing their browsed content through a digital scanner, which then reconstructs their reading pathways into new ebooks, allowing the creative process at work in the act of browsing to be visualized. In eScape 50, Schwartz plays another game with the past, treating ePaper the same way early photographers treated photography — using the technology to record the people and objects around them while exploring the medium. Developed in the 1990s, electronic paper (or ePaper) requires electricity only to change the image rather than to store it. Once captured, the image has a permanence resembling that of paper, thus transforming the ephemeral nature of the digital image. In eScape 50, Schwartz generates a mountain landscape through interference patterns, but the image stretching across fifty screens becomes an analogue of a black and white landscape photograph. In this inversion of the relationship between digital and analogue, only the metaphor of landscape remains in a haunting work that evokes the mountain as a lost object in a poor translation. 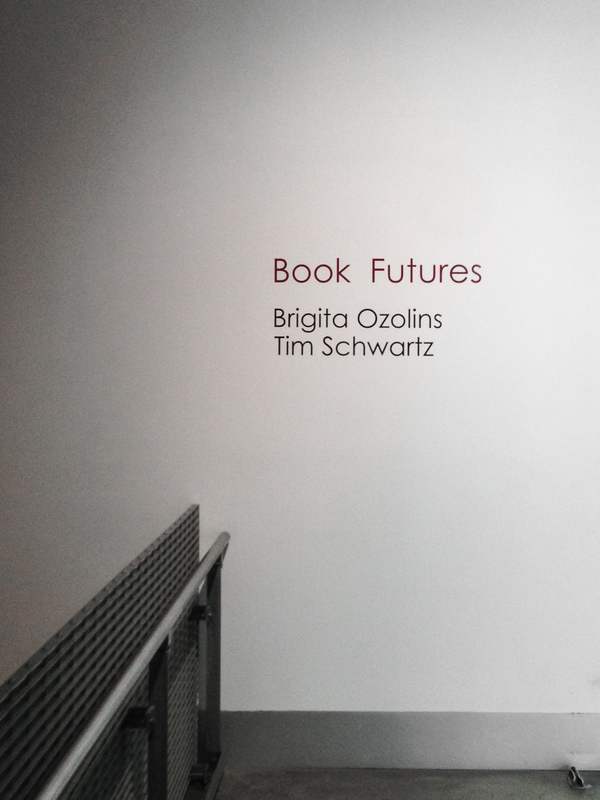 What both artists in Book Futures make evident is that while the book as a tactile, olfactory, haptic, visual and sensory memory-bank of the interior life may be lost to the future, artists such as Ozolin and Schwartz are on the trail of loss, finding new ways to make aesthetic gains out of change.